Because collegiate recruiting rules and regulations recently went from 7 down to 2 visits, there is a new reliance by coaches to use technology to connect with potential student-athletes opening the way for TPC to fill the void. Parents want to promote their children to scouts. Young athletes want to take control of promoting themselves using stats and highlights in a news feed fashion resulting in better organization and improved lead potential to NCAA basketball programs. TPC offers all this and more. Their traction is not an overnight success story, much like Twitch, they had to learn from past mistakes and rebrand. The Sports Techie community blog caught up with Corey Cooper, co-founder of CourtCred, after last chatting nearly 5-years ago when my son was around 18-month old over some local barbecue. I was happy to catch up, learn more about TPC and help spread the word. Cooper’s former app, The Ranks, was a fan driven social platform that ranked high school basketball players. His first startup opportunity unfortunately ended in 2016 but it exposed pain points and paved the way on what to focus on. The experience helped TPC get to where they are today with a spin-off of Ranks, looking for a pre-seed round of finance. Cooper relocated to Los Angeles because of a job move from Atlanta to San Diego, and then finally LA. He is excited to be around the L.A. start-up ecosystem while co-founder, Ikay Henry, feels the same about the N.Y. investors while they pitch the next big thing. Dj Dudley, point guard from San Diego in the 9th grade gave this grassroots designed application a social boost by becoming an early adopter ambassador by sharing his love of the app with his peers who then downloaded the app for themselves. This good fortune did not happen by accident, it was a result of lessons learned from operating the Ranks. 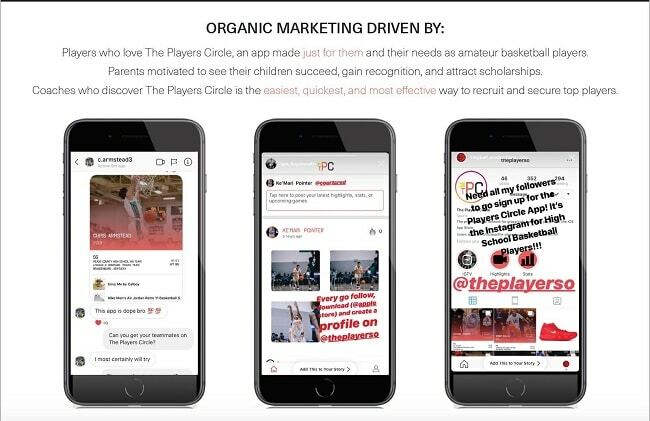 The Players Circle solution enables players/users to connect with college coaches on social media networks. Cooper feels like amateur athletes in all sports are their target markets. The app is most popular right now with youth sports and hoops; however, growth will occur through expanding their unisex following in all sport and activities. The social network grew by pulling in friends like Instagram did, each share resulting in more app use. They launched in February without much marketing growing their user base one-hundred percent via viral marketing over social channels. A big key says Cooper has been social media promotion and feedback from the kids. The recent updated version 1.3 was released after much insight from the kids wanting to promote their athletic feats while share their profile seamlessly to Instagram stories. About 100 users a week are signing up to use their iOS app. Athletes are looking for an alternative platform to get the digital word out about their game. Recruiters, even sponsors, can track the progression of these pro-active student-athletes as they post about their career accomplishments. I asked how they got the Big Mo started. Corey said it was because of SoCal AAU programs and relationships that led to meeting Russell Westbrook’s boys’ basketball team, Team Why Not. Once that happened, more players got on the platform, including DJ, his friends followed suit and downloaded it too. Corey said their company goal is to target top youth players and help them become power users. Cooper was excited about the app’s newest features. You can now share your profile on Instagram Story much like Dudley did to all his hoop mates using the newest feature with sharing to IG. Users can also easily invite others to join The Players Circle. Amateurism and athletes are the target market. After basketball success, the business plan is to grow into other sport, and grow vertically on a professional level and overseas. Adding information on former college players helps scouts find players. Eventually the app will enable an athlete and coach to find a trainer, workout experts, and nutritionist. Players can grow and prospers in the space and connect while getting help along the way. TPC acts as a social glue, allowing athlete connections via social. Much like LinkedIn, people now have a professional network for athletes to network. The competition are web based platforms according to Cooper. Be Recruited and other similar sports tech companies focus on being a recruiting service database. Overtime came to market and shows highlights of McDonald’s All-American players but not so much low DI, as well as DII and DIII athletes. Upon doing his due diligence, Cooper found there was not a product like TPC in the market. A mobile-first social platform is exactly what the players want in terms of usability, exposure and the overall experience. Corey feels a TPC profile is easier to use and designed with a built in user experience making the friction much lower in terms of a learning curve. When premier players sign up, it essentially becomes free marketing after they share what’s going on with their game to other TPC app users. TPC has grown from word of mouth and through the company Twitter and Instagram handles. Henry was given credit for his hard work growing their social channels from NYC where along with SoCal, a majority of their users reside. Revenue will be earned from a subscription based model. Free accounts are available for everyone while a premium account offers upgrades, discounts and camps, and unlimited hosting of game film, for a small fee. Right now advertising is not part of the user experience. Coding is handled by an internal team of developers. It took about 6 months to finish the app but 2-years total to go from idea to building the UI, going into development, flushing out the idea, understanding the market, creating a business plan, and executing it. AWS hosts the solution ensuring quick and easy scalability. TPC is looking for a pre-seed round of $500,000 with plans to build a marketing campaign then target programs across the USA as well as AAU basketball leagues, and tournaments. Cooper feels an accelerator program is the right path to fine-tune the business process and position TPC to raise more money. There is a vetting stage qualifier that gets met working with an accelerator. Having been through the ropes, Cooper and his team will raise the money and continue to grow the platform. The plan is to roll out in the next year, contingent on money raised though fund raising. For more information, please feel free to visit their website at theplayerscircle.co. Sports Techie, The Players Circle aims to level the playing field, urban or not, for overlooked players. They have a sweet spot with collegiate sports. Top-tier basketball youth are using the app to promote their game in Southern California, NYC/NJ, and the southeast especially Atlanta, and it is working. Look for more integration with Instagram and Facebook in the next app update. Startup investors can reach Corey at ccooper@courtcred.com.